WASHINGTON, DC — The Capital Trails Coalition released its diagrammatic map today, which captures the vision of a trail network for the D.C. metropolitan region. The map features existing and planned trails in the region. Currently, the region has 436 miles of existing trails, with 302 miles of planned trails to go. The planned trails will close gaps in the regional trail network and connect smaller trails to high-capacity trails, including the Metropolitan Branch Trail, the Mount Vernon Trail and the Capital Crescent Trail. The map also captures a massive vision across six jurisdictions — prioritizing connectivity for people who walk and bike and enhancing quality of life throughout the region. According to Katie Harris, Capital Trails Coalition coordinator, “our region is well-known for transportation corridors like our interstate system, but what might be lesser known is the high quality trail network that spans the region. This map is a vision of how we can change the way we think about transportation in the region,” said Harris. The sheer scale of a connected regional trail network will transform the way we view transportation equity and trail development in the future. The Capital Trails Coalition seeks to create a world-class network of multi-use trails that are equitably distributed throughout the Washington D.C. metropolitan region. The Capital Trails Network will transform public life by providing healthy, low-stress access to open space and reliable transportation for people of all ages and abilities. 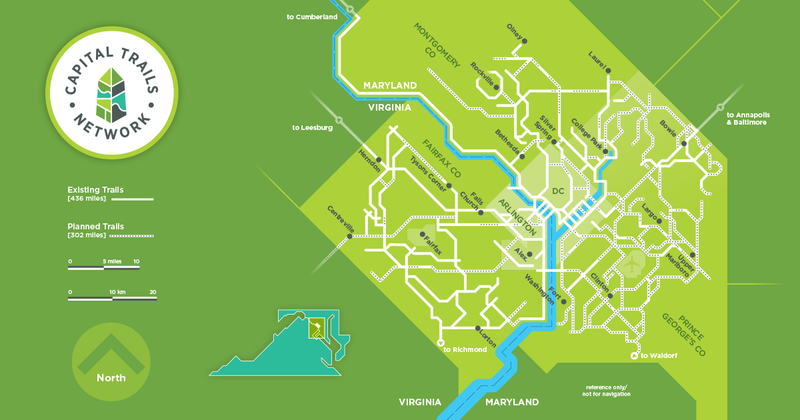 The Capital Trails Coalition is a collaboration of 60 organization members, including the Rails-to-Trails Conservancy, the Washington Area Bicyclist Association, various business improvement districts and citizen groups. The National Park Service serves as an advisory member.